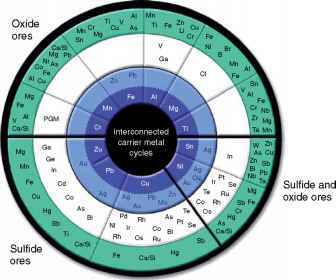 Figure 2 The 'metal wheel' showing the complex interactions between different metals as well as the economically and thermodynamically recoverability of (co-)elements. Reproduced from Reuter MA, Heiskanen K, Boin UMJ, etal. (2005) The Metrics of Material and Metal Ecology, ISBN - 13: 978-0-444-51137-9, 760pp. Amsterdam: Elsevier Science, with permission from Elsevier. the 'material and metal ecology' of a consumer product, for example, the car. Product designers select the produced metals and materials from (primary) resources as depicted by Figure 2 and apply them in products and applications. The product designers determine which interconnected materials are to be separated and recovered from primary ores for application in the car. During the design of the product a range of materials/ elements are once again mixed and complexly connected (gluing, welding, alloying, etc.). Modern products contain a combination of metals that are not necessarily linked in the natural resource systems as shown in Figure 2. As a consequence, these materials are not always compatible with the current processes in the metals production network, which was developed and optimized for the processing of primary natural resources and associated minor elements. 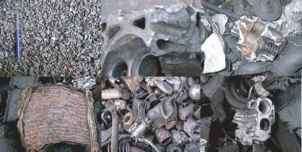 In general an increased complexity of recycling pyro-metallurgy has arisen through the development and design of modern consumer products (such as passenger vehicles and consumer electronics). 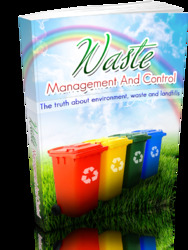 The consequence is the formation of complex residue streams or undesired harmful emissions that cannot be handled in the current system (thus the processing and recycling of those products at their end-of-life). This can be prevented by linking product design with optimized recycling technology, therefore minimizing the loss of valuable material and preventing the decrease of both quality of recyclates and recycling rates of these products. Commercial recycling systems never create pure material streams (see Figure 5 for materials from end-of-life-vehicles (ELVs) recycling collected from various shredder plants), never achieves 100% material recovery (recycling) during physical separation (dictated by separation physics), neither achieves 100% material recovery (recycling) during high-temperature metal production (dictated by thermodynamics), and nor achieves 100% energy recovery (dictated by thermodynamics). 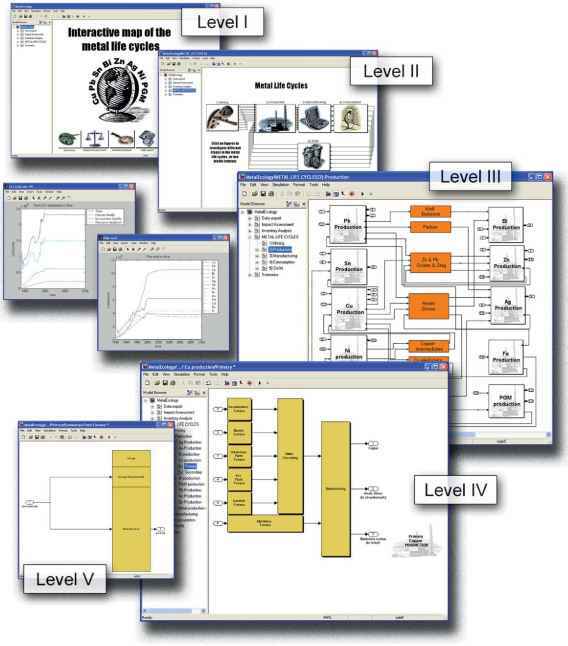 Figure 3 The various levels of the dynamic Simulink model that dynamically links the metal flow of various metals as shown in the level III slide, producing a dynamic LCA environmental score for the complete system (two small gray windows left middle). Reproduced from Reuter MA, Heiskanen K, Boin UMJ, etal. (2005) The Metrics of Material and Metal Ecology, ISBN - 13: 978-0-444-51137-9, 760pp. Amsterdam: Elsevier Science, with permission from Elsevier. efficiency, metallurgical and energy recovery, which all in turn determine the quality and economic value of the recycling (intermediate) products in the recycling system, which can be applied as secondary resources. Figure 4 The link of a car design to the recycling chain, which includes selective dismantling, size reduction, and subsequent physical separation, metallurgical, and thermal treatment. 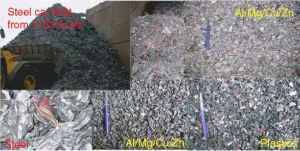 Figure 5 Impure quality materials created during physical separation of shredded ELVs (clockwise top left: steel, wires, Mg/ Al/Zn/Cu/SS, steel/Cu, Mg/Al/Zn/Cu/stainless steel (SS), and plastics). Reproduced by permission of Elsevier. the design of the product (material combinations and connections). In order to optimize the resource cycle and maximize the recycling rate of (future) products all the parameters determining the recycling/recovery rate for each of the materials present in the multimaterial designs and applications of the present and future have to be fully understood. 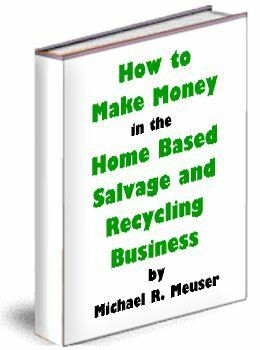 This should all embrace the dynamics and statistically distributed nature of the resource cycle system. Figure 6 The 'mineral' aluminum in its different appearances (liberation and particle-size classes) as a high-quality liberated fraction (top left) to unliberated radiator (bottom left) and various unliberated mixed fractions that cannot necessarily be recycled directly. Figure 7 Possible connection types in car design with distinctive liberation behavior. From van Schaik A, Reuter MA and Richard A (2005) A comparison of the modelling and liberation in minerals processing and shredding of passenger vehicles. In: Schlesinger ME (ed.) EDP Congress 2005, pp. 1039-1052. TMS (The Minerals, Metals & Materials Society). function of material/mineral classes, particle-size classes, liberation classes (degree of liberation); (2) the value of intermediate streams; (3) separation physics and thermodynamics; (4) losses and emissions; (5) harmonization of plant/flowsheet architecture with changing product design; and (6) distributed and dynamic properties of present and future product designs (see Figure 8 for a detailed flowsheet of the recycling optimization model). Figure 9 shows how after shredding, shredded particles have different degrees of liberation, therefore creating streams of different composition (quality and economic value). This is partially caused by imperfect separation in the physical separation stage of these particles and also by the design choices as shown in Figure 7, affecting particle composition after shredding. The quality of recyclate streams ultimately determines in which processing steps depicted in the detail flow sheet in Figure 8 these materials can be processed and hence how much material of sufficient quality and economic value can be recycled. Figure 10 depicts how product design selects materials from the primary metal and material cycles and combines them into a complex multimaterial design, in which the various materials (metals and nonmetals) are complexly integrated. The combination and connection of the materials in the product design is linked (on the basis of the discussed recycling models) to the quality of recyclates as a function of the degree of liberation of the various particles after shredding. 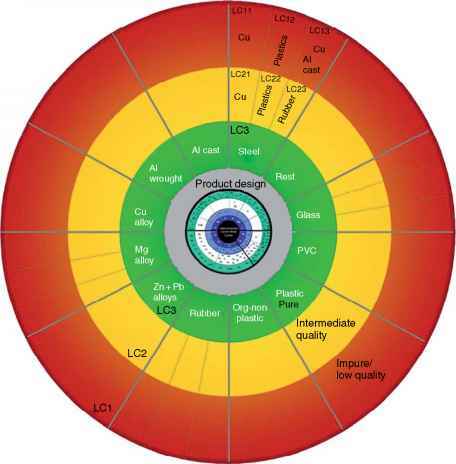 The colors in the 'design wheel' of Figure 10 reflect the (in)compatibility of material combinations in the recyclates (either due to imperfect liberation or separation) based on the material combination matrix given in Figure 11 , in which the (in)compatibility of material combinations is based on the thermodynamics and kinetics of metallurgical processing (see also Figure 2). Figure 10 reflects the knowledge and modeling detail captured by the developed recycling optimization tools and provides feedback to the designer on desired and undesired material combinations in the design. The wheel acts as a preliminary design for recycling (DfR) tool, reflecting the complexity and detail of the developed recycling models to ensure a proper reflection of the reality of recycling system behavior and the quality and value of produced recyclates. The wheel enables DfR based on the limits and possibilities of recycling technology and recyclates quality as a function of design and separation efficiency. In summary therefore this wheel shows what can be achieved as a function of design in combination with 'best available technology' (BAT) and hence the limits of physics and chemistry as taking place in the technology. 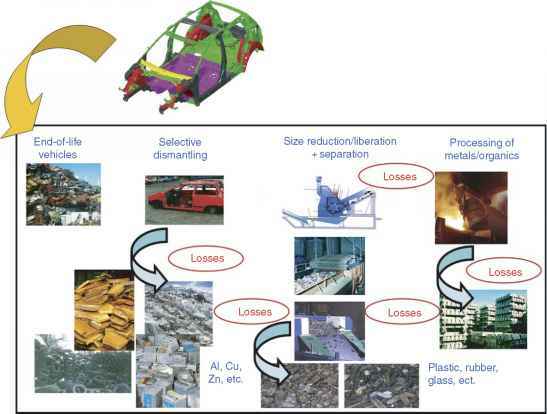 Figures 4, 8, and 9, respectively, depict a simple scheme for car recycling and a complex optimization model for recycling of end-of-life products such as a car. Figure 12 depicts the (un)liberated particles after shredding (Figures 6 and 9) which determines its recyclability due its quality (and hence its economic value). These determine whether or not the material chain can be closed. Table 1 explains why, if certain fractions are liberated, unliberated, whether they can be fully recycled or not. For example, copper connected to steel will dissolve in steel. Since copper is more noble (less reactive to oxygen) than steel it cannot readily be removed from the steel. This affects the steel quality negatively (e.g., its mechanical properties) and therefore it is given a red color in Table 1. Note, that this is dependent on the amount of the one material connected to the other (the concentration of the contaminant). In many cases, although red material combinations exist, shredding liberates the materials, which are subsequently separated during physical processing and hence they are recyclable. Figure 11 and Table 1 are only true if there are reasonable amounts of materials connected in the recyclates (exceeding the contamination limits), hence producing alloys outside their normal definitions. The type ofmodels as discussed above can predict the recyclate quality and therefore link design to recycling and restrictions as indicated in Table 1 . 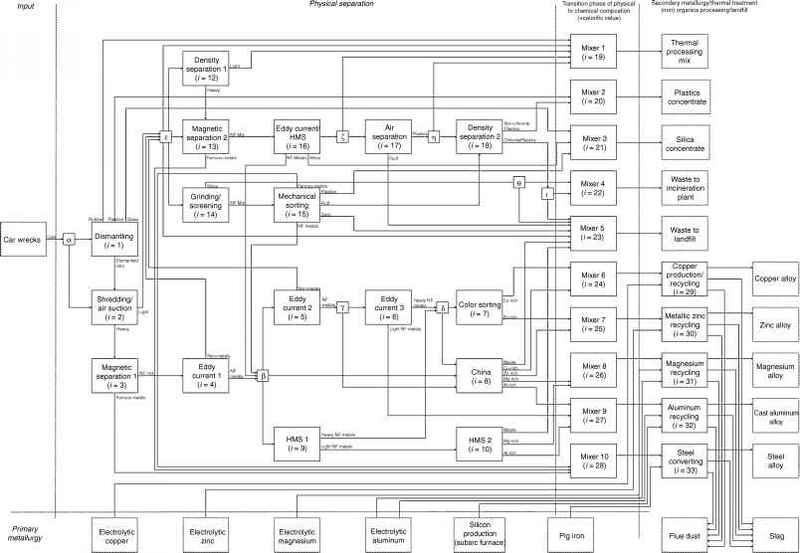 Figure 8 Flowsheet of detailed recycling system optimization model (programmed in AMPL). Reproduced from (Reuter MA, van Schaik A, Ignatenko O, and Hann GJ de (2006) Fundamental limits for the recycling of end-of-life vehicles. Minerals Engineering 19: 433-449, with permission from Elsevier. Figure 10 The 'design wheel' illustrating the underlying liberation classes that are created as a function of product design as predicted by the recycling model depicted in Figure 8. Reproduced from van Sehaik A and Reuter MA (2007) The use of fuzzy rule models to link product design to recycling rate calculations. Minerals Engineering 20: 875-890, with permission from Elsevier. into LCA tools, in order to ensure that environmental models are provided with fundamental information on the end-of-life behavior of products which include (1) physics and thermodynamics of separation processes, (2) the quality and value of recyclates as a function of physical design choices (material combinations and connections), and (3) physical separation and metallurgical and thermal processing technology on a statistical basis. Figure 11 Material combination matrix: permitted connections and nonpermitted connections and combinations in particles after shredding and separation. Reproduced from Reuter MA, Heiskanen K, Boin UMJ, et al. (2005) The Metrics of Material and Metal Ecology, ISBN - 13: 978-0-444-51137-9, 760pp. Amsterdam: Elsevier Science, with permission from Elsevier. Figure 12 A selection of liberated and unliberated particles from the car model given in Figure 4. A section from the compatibility matrix (Table 1 and Figure 11 - please note that colours of particles are those of the body-in-white (BIW) in Figures 4 and 9).